We are a big fan of nachos in my house, so much that we pretty much have a nacho night on the weekly dinner schedule. 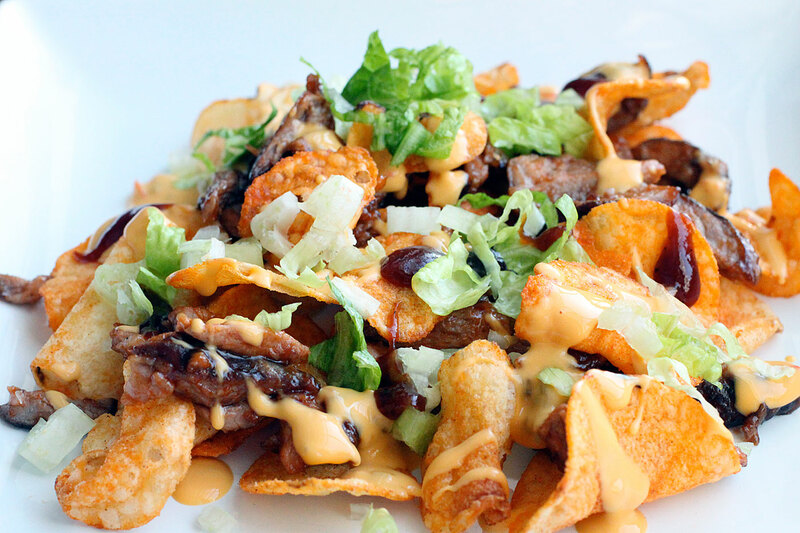 They are pretty much the typical nacho fare. An array of vegetables, with hope that the kids will put some on their nachos, and your classic guacamole, homemade roasted salsa, shredded cheese, and my daughter’s new favorite, salsa con queso. With that said, I, personally, am a big fan on putting twists on classic nachos such as nacho potato skins, pizza nachos, Idaho nachos, chicken mole nachos, and now these bbq style nachos. I thought that by using BBQ kettle chips as the vehicle, along with some roasted pork, I could get away with something great, and boy did I ever. Sweet, with a bit sassy, these nachos were awesome. This is so simple to put together. Lay the chips onto your serving plate. Add the pork to a skillet, set on medium-low heat. Add in the barbecue sauce, and mix. Basically warm the sauce and pork. Once warmed, add to the top of the chips. Warm up the additional barbecue sauce. Drizzle the warmed queso over the pork and chips, along with the warmed barbecue sauce. Top with the shredded lettuce, and dig in. The end result is pretty great. 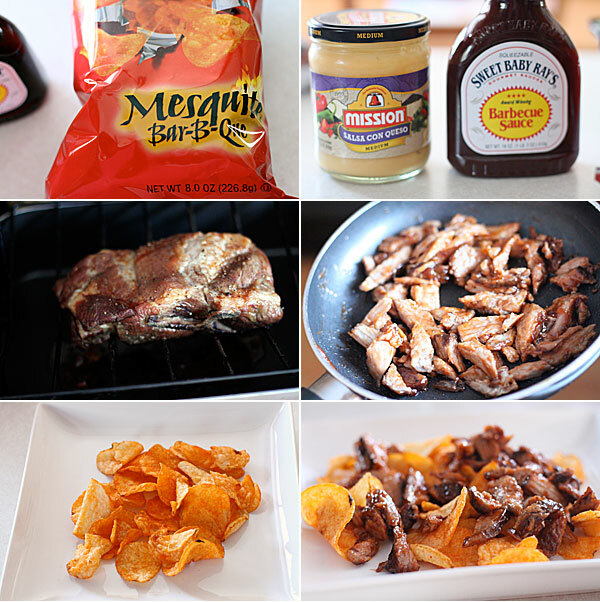 You get that killer barbecue in every bite, and the kettle chips introduce a whole new thing to the recipe. Let’s just say these did not last very long as they were that great. So if you are looking for a new take on a nacho recipe, give this one a shot. Hope you enjoy! That is an awesome name for the nachos! I might have to change the title. These look so very tasty. I might have to brave the snow to go get some tater tots! LOVE this idea! Definitely will try for the next Chiefs game! Thanks Stephanie! They are good. Really, really good.